Back in the summer of 2007 I was just stepping into the large world of alternative energy, some of the things I read about were largely involved with Hydrogen and I believed that Hydrogen would become the future of energy. There are two main ways to use Hydrogen as a fuel for vehicles. Using both compressed hydrogen and oxygen gasses, and expel them at very specifically regulated amounts into a “fuel cell” which in simple terms “reconnect” the molecule of water H20 and during this transformation a small amount of electrical energy is released and captured by small wires that can then store the electrical energy for use. this method requires highly compressed gasses, batteries, an electrical motor, control systems, and very complex fuel cell’s. This method has proved to be too complex and requires many safety systems, and also very inefficient. The second method uses the hydrogen as a combustible fuel in the cylinder of a four stroke compression engine. This method takes compressed hydrogen gas and directly injects it into the intake manifold as close as possible to the intake valve. By using hydrogen in this manner the throttle plate must be left wide open or removed. The engine speed is controlled fully by the amount of hydrogen injected into the engine regulated by a valve. This method uses an extremely high amount of hydrogen, far more then we can safely store on current automobiles. Advancements on hydrogen storage has come a long way, some companies claim using a “carbon sponge” material inside a compressed cylinder can vastly increase the usable PSI of space. Unfortunately this still does not eliminate the several thousand psi tanks that must be aboard vehicles that are essentially mobile bombs. Even a small leak of explosive hydrogen could result in a massive invisible flame that could possibly injure or kill people. I proved the second method using hydrogen gas as a combustible fuel when I converted my Toro lawnmower to run on pure hydrogen gas this conversion is fairly simple and straightforward. -Simply remove the carburetor and simply route a small 2mm-4mm diameter copper/steel line into the intake manifold and make the line face the intake valve as close as possible without touching it. -Then make a double valve system, one being an accurate nettle adjustment valve for idle gas and idle adjustment. The other will be run in parallel and needs to be a 0%-100% throttle valve. -Use one side for input of hydrogen gas and the other is run to the line in the intake manifold. -NOTE: most engines will require the ignition timing to be slightly retarded because the difference in burn rates of gasoline and hydrogen gas this can be done by adjusting the distributor or making a smaller flywheel key way. I can conclude from my research in hydrogen fuel that it is an effective method for running compression 4 stroke engines. The exhaust contained no carbon by-products and little or no toxins. 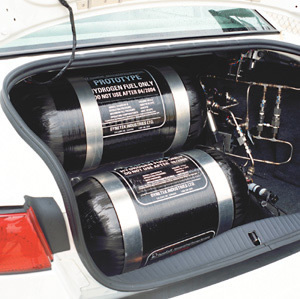 The biggest deterrents of using hydrogen as a fuel is the storage problems, re-fueling issues, production of cheap hydrogen, and the obvious safety concern of driving around with 40-60 thousand psi of explosive hydrogen on board your vehicle. I do however possibly see a future of hydrogen fuel for the trucking industry and/or heavy-duty vehicles requiring large amounts of torque and little down time. Only slight modifications would be needed to make the engines run, and a network or hydrogen re-fueling stations on interstates would not be difficult to start.